Bengaluru got their I-League campaign to a winning start beating Salgaocar FC 1-2 at the Tilak Maidan, Goa, on Saturday. A 5th minute tap in from CK Vineeth and a freekick in the 61st from skipper Sunil Chhetri meant the Blues kept their 100% win record over Salgaocar in the League, intact. A penalty from Darryl Duffy had helped Salgaocar pull level late in the first half. 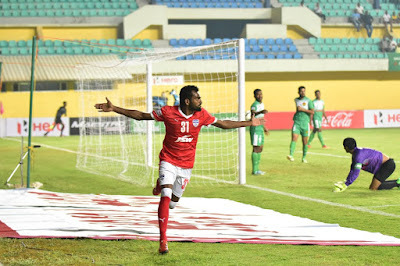 The game began with Bengaluru FC largely dictating the state of affairs and penetrating the Bengaluru defense in the final third. The hosts however looked to missing the much needed creative spark in their ranks as their attacks failed repeatedly.